Approximately 800,000 young unauthorized immigrants have received work permits and protection from deportation through the Deferred Action for Childhood Arrivals program, or DACA, since its creation five years ago. And nearly 690,000 of these immigrants are currently enrolled in the program, according to new data from U.S. Citizenship and Immigration Services. The program’s future is uncertain after President Donald Trump’s recent announcement of plans to phase it out. The U.S. government is not accepting new DACA applications and will stop accepting renewal applications on Oct. 5. Those currently enrolled in the program retain their benefits, which last for a total of two years. In the new data, U.S. 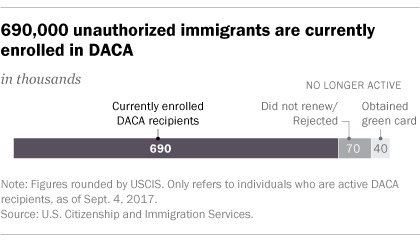 Citizenship and Immigration Services has for the first time released detailed demographic information about those currently enrolled in DACA, a group sometimes called “Dreamers.” Here are some key facts about these individuals, based on the new data. To qualify for DACA, enrollees must meet certain conditions, such as being enrolled in high school or having a high school diploma or GED equivalent, and not being convicted of a felony, significant misdemeanor, or three or more other misdemeanors. Current DACA recipients come from around the world, but more than nine-in-ten were born in Latin America. Mexico is by far the top country of origin for active DACA recipients (548,000), followed by El Salvador (25,900), Guatemala (17,700) and Honduras (16,100). A significant number of DACA recipients also hail from Peru (7,420), South Korea (7,310), Brazil (5,780), Ecuador (5,460), Colombia (5,020) and Argentina (3,970). By region, almost all current DACA recipients were born in Mexico or Central or South America (648,430, or 94%). Another 18,940 (3%) were born in Asia, followed by the Caribbean (8,350), Europe (5,190) and Africa (4,240). Three-quarters of DACA recipients live in 20 U.S. metro areas. With 89,900 DACA recipients, the Los Angeles-Long Beach-Anaheim metropolitan area had the largest number of active enrollees as of Sept. 4. That was nearly twice as many enrollees as the next largest metro area, New York-Newark-Jersey City (47,200). Other top metro areas include Dallas-Fort Worth-Arlington (36,700), Houston-The Woodlands-Sugar Land (35,800) and Chicago-Naperville-Elgin (34,100). 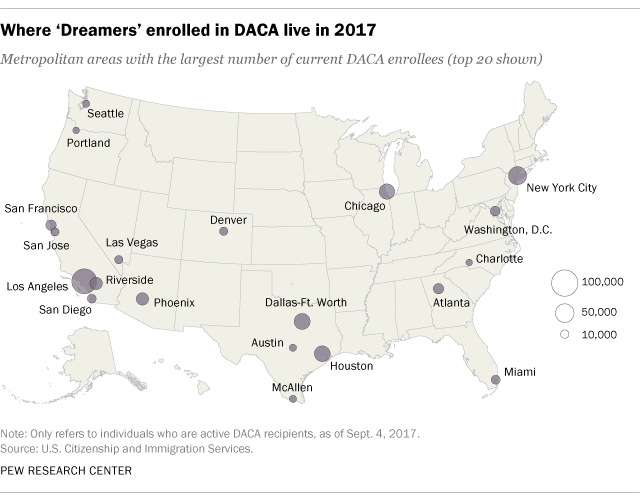 The top metro areas of current DACA recipients are similar to those of the nation’s unauthorized immigrant population as a whole. Nearly half (45%) of current DACA recipients live in just two states: California (29%) and Texas (16%). Illinois (5%), New York (5%), Florida (4%) and Arizona (4%) also have significant populations of active DACA recipients. Two-thirds of DACA recipients are ages 25 or younger, and a majority are women. 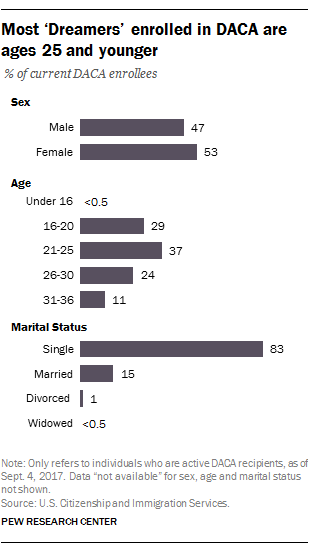 Women make up a slight majority (53%) of active DACA recipients, while 47% are men, according to the tabulations from U.S. Citizenship and Immigration Services.